A physical and aggressive player, Watson has attracted plaudits and criticism in equal measure during a high-profile career. An U19s, U21s and Sevens international, he rose to prominence with Western Province and the Stormers in Cape Town where his outstanding form saw him named as South Africa's Super 14 Player of the Year in 2006. He made his Springboks bow the following year but his elevation to the squad only came after the intervention of South African Rugby Union (SARU) chief Oregan Hoskins who insisted on Watson's inclusion after coach Jake White had omitted the player. The strained relationship between player, coach and the rest of the squad ensured Watson missed out on selection for the 2007 Rugby World Cup but he returned to the international ranks the following year under new coach Peter de Villiers - winning a further nine caps. Watson's father, Daniel 'Cheeky' Watson, was one of the first white rugby players to take a stand against apartheid in the 1970s, playing in mixed-race rugby matches and his son's promotion to the Springboks was seen by some as a political move with White an outspoken critic of the player's ability. In 2008, Watson voluntarily withdrew from contention for international honours while under investigation by SARU following alleged derogatory comments about the running of rugby in South Africa. Watson made his Currie Cup debut for Eastern Province at age 18 and went on to play for the Sharks and Western Province in South Africa's leading club competition. He made his Super Rugby debut playing for the Sharks in 2003 before a move to the Stormers in 2005 where he went on to captain the side. 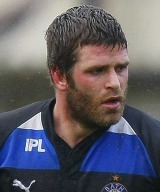 He opted for a move to English side Bath in 2009, becoming a popular figure at the Rec. He captained the side in the 2010-11 season but announced in December 2010 that he would be returning to South Africa in order to take up a contract with the Eastern Province Kings.